Want to know how well your social media strategy is working? Otherwise, we can’t know whether we are getting all we could out of those social platforms. A number of applications are clamouring to give us the low down. The loudest is probably Klout, but it’s by no means the only one gaining traction. 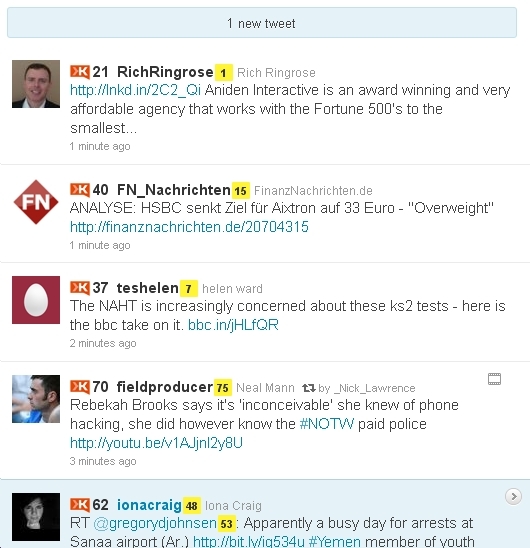 There are also TweetGrader, PostRank Analytics, Peer Index and Twitalyzer, among others. I’ve been trialling that shortlist for a couple of weeks, to see what each could tell me about my social engagement. They’ll all give you a grade, so you get some idea of how well you are doing, both in absolute terms – marks out of a 100 usually – and compared to others. But, when looking at how these apps perform, it’s hard to compare like with like. For example, in the grab below you'll see the latest handful of tweets that happened to land from those I follow just as I was writing this sentence. None are the same. Some are reasonably close, but others vary wildly. So how can I - and they - know which of these two scores is the more accurate measure of their social engangement? Using myself as an example, I found that my scores on the five platforms I've been testing are all very different. They differ because the five all appear to use different algorithms, and to put weight on different aspects of your social presence. Which is why, I guess, I can get a high of 95 on TweetGrader, a low of 1 on Twitalyzer and marks in between – 46 on Klout, 52 on PeerIndex and a highly variable ranking, today of 0 on PostRank. It's often 1, and at other times varies wildly, but has never been higher than 35. All of which is puzzling, and confusing. Which of the five scores I get is the most objective, and hence the most valuable? Which actually measures the aspects of my social performance that are important to me? I’m not going to pretend I have been able to gain a completely clear answer to that question, but here’s a run-through of what each of those brands says about me, and a bit about how they work. What’ll be the best one for you? The best bet is probably to try a couple that looks like they do what you need, trial them, and take it from there. You can click below to get started with the first I look at.